The day after award shows is the most predictable day on the network. As I watched Fox News’ coverage of Time’s 2018 “Person of the Year” announcement, something struck me: I’d seen it before. Several times, in fact. This year, the distinction was given to “The Guardians and the War on Truth,” highlighting journalists lost to violence (such as Jamal Khashoggi and the staff at the Capital Gazette) or arrested for their work (such as Reuters’ Wa Lone and Kyaw Soe Oo, who were arrested while reporting on the killings of Rohingya Muslims in Myanmar, or Maria Ressa, who the Philippines government charged with tax fraud over reporting for her site, Rappler). The truth is that it didn’t actually matter whom Time picked -- at least in terms of how Fox News would cover it. Regardless of the choice, various commentators across the network would chide the decision as somehow anti-Trump or self-serving before telling viewers whom it should have been. It’s what they’ve done in the past. After Time highlighted the #MeToo movement by choosing “The silence breakers” in 2017, Fox hosts suggested it should have also gone to Trump’s Twitter account. In 2012, Fox personalities Andrea Tantaros and Dennis Miller derided Time’s inclusion of reproductive-rights activist Sandra Fluke in its list of finalists. In 2010, Bill Hemmer suggested it could have gone to the tea party movement instead of Facebook’s Mark Zuckerberg, and Glenn Beck wove together a conspiracy theory about how George Soros was responsible for Beck’s own low numbers in Time’s online poll. In 2008, Sean Hannity suggested that then-President-elect Barack Obama was named Person of the Year because Vice President-elect Joe Biden hired the magazine’s Washington bureau chief as his communications director. Fox’s coverage of the 2018 unveiling was extremely predictable. On the December 11 edition of The Ingraham Angle, Laura Ingraham played host to Raheem Kassam, whose Daily Caller essay “Time’s Failing ‘Person of the Year’ List a Product of Cultural Decline” had been published that morning. Ingraham would close out the evening’s show with her own picks, a tie between first responders to the California wildfires and Border Patrol agents. JESSE WATTERS (CO-HOST): All right. Dana, you've seen these things before. Is Time magazine Person of the Year -- is this a thing of the past? Does anybody care anymore? GREG GUTFELD (CO-HOST): Because it's fun. Jesse Watters is probably right when he suggests people don’t care much about the magazine cover anymore, and Perino is right on the money when she acknowledges that they keep covering it anyway. If you consume enough conservative media, you’ll begin to see this pattern play out in all sorts of ways, and it’s almost certainly not accidental. Whether it’s Time or any other magazine’s Person of the Year choices, the Oscars, the Grammys, the Emmys, or Golden Globes, Fox News follows a brilliant formula designed to reinforce the idea that pop culture exists largely for the purpose of marginalizing conservatives. In 2018 alone, there’s been Sean Hannity’s post-Oscars rant accusing Hollywood of hypocrisy for the #MeToo movement, Greg Gutfeld and Michelle Malkin’s accusations that Oscar attendees who spoke out about gun violence were “virtue signaling,” Jason Chaffetz taking on “Hollywood’s cultural rot” (i.e. Kevin Hart getting in a few jokes at the president’s expense during the MTV Video Music Awards), Martha MacCallum pulling a joke out of context to slam the Emmys, and Howard Kurtz’s bizarre claim that the Oscars and Emmys have “obligatory Trump-bashing moments.” These are among the many examples of Fox News using pop culture events to reinforce the “us versus them” mindset in its viewers. In September 2017, Tucker Carlson called the Emmys “an expression of the contempt America's ruling class has for the rest of the country,” seemingly oblivious to the irony of labeling liberals “America’s ruling class” as Republicans controlled the White House and both chambers of Congress. Carlson would bring back his “ruling class” comment during his November 15, 2017, show by criticizing Maxine Waters’ appearance at the Glamour Women of the Year awards. And when GQ put Colin Kaepernick on the cover of its magazine as the 2017 “Citizen of the Year,” The Five’s Watters said he’d prefer the award went to NFL star J.J. Watt. During the Fox & Friends coverage of the 2015 Oscars, Stacey Dash slammed Patricia Arquette for her on-stage discussion of pay inequality. Also in 2015, The Five mustered up the courage to at least pretend to care about the ESPY Awards if only to express discomfort with the decision to give Caitlyn Jenner that year’s Arthur Ashe Courage Award, instead of college basketball player Lauren Hill, who spent her final days raising awareness about cancer among young people. Fox News uses manufactured outrage as a tool, and it's become so useful that some of its viewers have tuned out pop culture as a whole. Can a piece of art change the world? Maybe. Can a speech delivered from the Oscars stage heal a country? I suppose it’s possible, even if extremely unlikely. Yet, if you’re someone with a vested interest in preventing forward social change or you rely on resentment of “elites” to fuel your own political agenda, it would be beneficial to sow distrust of the people making that art or giving that speech. If you can convince your target audience that the artists can’t ever truly understand America, that they’re all rich elitists -- though many are less “rich” and arguably less “elite” than the people delivering messages on your side of this culture war -- you can use even the most anodyne cultural events to your advantage. The morning after the 2018 Oscars, Fox & Friends asked its viewers whether they had tuned in. The responses they received, or at least the ones they decided to read on air, show just how successful this campaign has been. “Of course we didn’t watch. We are looking to be entertained, not aggravated by a steady stream of mindless drivel from liberals who live in a bubble,” read one message. “Very happy to report I did NOT watch the Oscars last night. Watching self-aggrandizing Hollywood elites speaking into their echo chamber isn’t something I enjoy doing,” read another. By their own accounts, these viewers didn’t actually watch the Oscars, but they knew the awards show was bad -- instinctively. Even moments seemingly geared toward winning conservative kudos -- such as the tribute to war films -- were labeled insulting because the audience didn’t rise to its feet for a standing ovation. The pop culture well has been poisoned, and anything short of explicitly conservative propaganda will be met with unease. When it comes to pop culture criticism, conservative media aren’t acting in good faith. I don’t see that changing any time soon. Ahead of award shows, some people like to make predictions about who will take home what honors. My predictions are a lot simpler. 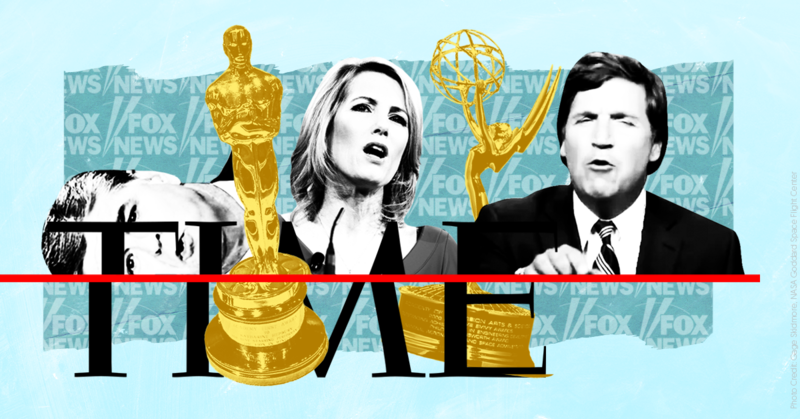 In 2019, 2020, and beyond, it’s a safe bet that Fox News will pan all the major awards shows, scoff at magazine covers as “identity politics,” and continue to cultivate the resentment that is so core to its brand identity. None of this is to say that everything said at the Oscars will be profound, nor will every Grammy serve as a reward for advancing some sort of social agenda. What I am saying is there is something we can all do as media consumers to bridge cultural divides: We can go into experiences with open minds and open hearts. This can mean different things to each of us, and it could be as simple as stepping outside your comfort zone when it comes to choosing what to put on your morning playlist, which movies to check out while they’re in theaters, and which news sources you give a chance.